Google weblog: "If you impugn the artistic integrity of the guy who draws the Google doodles, you can expect a very direct and very public smackdown." Major pilot error in today's podcast. I had to hit pause when I accidentally entered the town of Tonopah about 80 miles sooner than I thought. Then when I resumed my travels, I hit Resume, or so I thought. But all you hear is me breathing. No talk, no music. What did you miss? A redneck Bush voter tailgaiting me. A description of the new software I'm going to work on. I guess that'll have to wait. I left my coffee on the roof of the car. Not at all sure how I fucked up so bad! Wow. I need a producer. Seriously. Or a big red button. Yeah. More coffee? That too. Today's song: "I've been from Tucson to Tucumcari..."
A Google Answer about "wheat, rice and wine." Excellent informative answer, it's not wheat and rice that Lowell George is singing about, it's weed (marijuana) and whites (uppers). Hey according to Blogcritics, Willin is one of the top all-time road songs. Scoble asks where you find new podcasts. John Battelle has an idea for advertising on the Internet. Here's an even more radical idea. Advertiser takes ad and puts it on his or her own website and waits for people to come read it. No one comes? Rewrite the ad. Still no one? Rewrite again. Eventually, if your product is any good, people will come, read it, buy your product, be happy customers, tell their friends, come back for more, etc. Think about how many commercial messages you seek out every day? Now you gotta wonder why advertisers are willing to pay good money to try to force a "message" on people who don't care. John's idea goes part of the way. Let's go all the way. 3:20PM: Arrived in Las Vegas. Amazingly, no one flamed me for the essay below. While driving today I kind of regretted posting it. I imagined people who would call me a Scrooge. Then I realized how unfair the whole idea of Scrooge is. Suppose you don't like Christmas. Well, now you have a super-negative image of what it means to not like Christmas. Okay, I got over it, but then realize that every Christian also has that super-negative image in their mind. 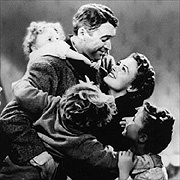 And if that wasn't bad enough there's the image of Jimmy Stewart and Donna Reed in It's A Wonderful Life talking about Mr Potter, who is the 1946 version of Scrooge. Well I've never said Bah Humbug without a big smile on my face and I love a good party, and now that I know you all still like me even if I don't like Christmas, well maybe that opens up the space to actually liking Christmas. Thanks for going with me on this little twisty trip through my mind. All around the blogosphere are notes that they'll be back in a week or so when the calendar has rolled over. No such luck with Scripting News, where this time of year marks a ramp up of activity. Sorry I don't do Christmas. There I said it. I don't like the holiday. Materially, I have everything I want. I have done Christian Christmas and Jewish Christmas. I've noticed that people who say they are experiencing the cheer of the holiday are tense, sometimes grouchy, and a lot of them are drunk. I'd be much happier if we could do some spontaneous carol-singing and ho ho ho'ing in January or May or September. By moving around I've lessened the effect of the holiday on my existence; it used to be, when I was stationery, that a full two months of the year were spent in fake joy-ery. Now I've got it down to just a few days. I have a programming project to do, and hiking in the canyons of northern Arizona, and great food. I want to lose some weight, get some color in my face, and surprise people who don't expect much innovation in 2005. And while I don't like Christmas, I do like the secular New Year's. Instead of celebrating the birth of a martyr over 2000 years ago, let's raise a glass in remembrance of 2004, and in expectation of 2005. Last update: Thursday, December 23, 2004 at 10:41 PM Eastern.